This program sets up a multi-person game in which each person chooses whether or not to enter a market or other activity in which the earnings for each entrant depend on the number of others that enter. The payoff for not entering is constant and independent of other's decisions. If the number of participants is large, the equilibrium will be characterized by equal expected payoffs for entry and non-entry, which results in over-entry. 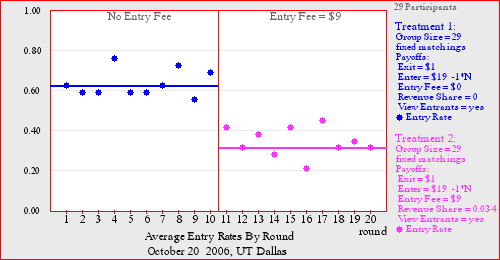 The resulting congestion can be controlled by imposing an entry fee that forces entrants to pay the external costs imposed on others. The entry fee or toll is set by the experimenter. Alternatively, you can stop play and let the class vote on a fee for the next round (with fee revenues to be divided equally). Students are surprised by the observation that a tax can be beneficial in this context.